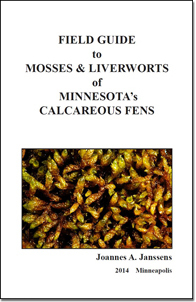 Minnesota is home to over 500 species of mosses, liverworts and hornworts, collectively known as bryophytes. Compared to other plants, bryophytes are small and relatively simple- they lack roots and a vascular system. Bryophytes do not have seeds or flowers; instead they reproduce largely via spores or vegetatively. They now inhabit a variety of environments throughout the state, growing in mats or cushions on rocks, soil, or on bark and coarse woody debris of forest trees. Identifying mosses and bryophytes can be difficult due to their diminutive stature and subtle differences between species. 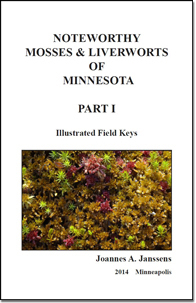 Bryologist Joannes A. Janssens' Noteworthy Mosses & Liverworts of Minnesota Part I: Illustrated Field Keys, Noteworthy Mosses & Liverworts of Minnesota Part II: Species Fact Sheets, Field Guide to Mosses & Liverwort of Minnesota's Calcareous Fens, and Illustrated Glossary to the Field Guides of the Mosses & Liverworts of Minnesota feature highly-detailed photographs, technical illustrations, maps of known ranges, habitat descriptions, aids to identification, and comparisons to similar taxa for nearly 100 of Minnesota's moss and liverwort species. The guides are available in web-delivered pdf format for personal viewing and printing. The keys focus on features visible in the field—along with photographs—that illustrate identifiable characteristics for nearly 100 of Minnesota's most-frequently recorded and widespread moss and bryophyte species. This booklet provides factsheets for the species featured in the field keys. Factsheet information is organized under the headings Scientific Name, Synonyms, Abundance (including MN distribution map), Habitat and Field Aspect, Aid to Identification, and Look-Alike Species. 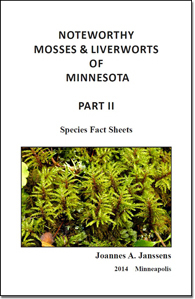 This booklet provides a combination of keys and factsheets for 25 of the most-frequently found species in Minnesota's calcareous fens. 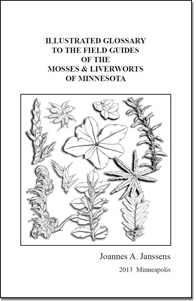 This document is a glossary of terms which describe the structures and functions of mosses & liverworts of Minnesota with figures and photographs for reference.